Eeep, it's been a while. Hello blog! So I haven't done much in the way of scrappy things of late. I don't know where the time goes! Or, more accurately, I know exactly where it goes, but there isn't enough of it. But I have made this page which will also be joining the ranks of the Guiding pages. It tells of my first camp as a leader. Except in the middle of the night when they complained about the Australian red ants in their tents. This being obvs not true. It was moths outside their tents that were attracted to the light their torches made. We had these massive tents that were too heavy for the Guides to put up so we "helped". ie. did it for them. Each tent had a central area big enough to stand up in and a little pod each side that would sleep four girls. Although on the Saturday morning, we found all 8 girls from one tent curled up together in one pod. They said they were cold, which they might have been, but the masses of sweets surrounding them told a different story. But as we all know, Guiding, and especially camp, is about having as much food as you possibly can and then making sure any activities in between food involve eating in some way, or use up enough energy to facilitate more eating. It's basically the rules. Absolutely idyllic, really hard work, so much fun. P.S. Speaking of really hard work, had a lovely exciting big promotion at work! But that means lots more to do. However, I get my own office to do it in. Thinking of turning it into a craft room as technically, no one has forbidden me to do this. I think they're just assuming I won't. Love your page and well done on your first camp! Go for the craft room - I can see a whole new trend for offices all over the uk! lol! Congrats on the promotion..love the page! Congratulations on the promotion, I would go for a craft office too - what the eye can't see and all that! 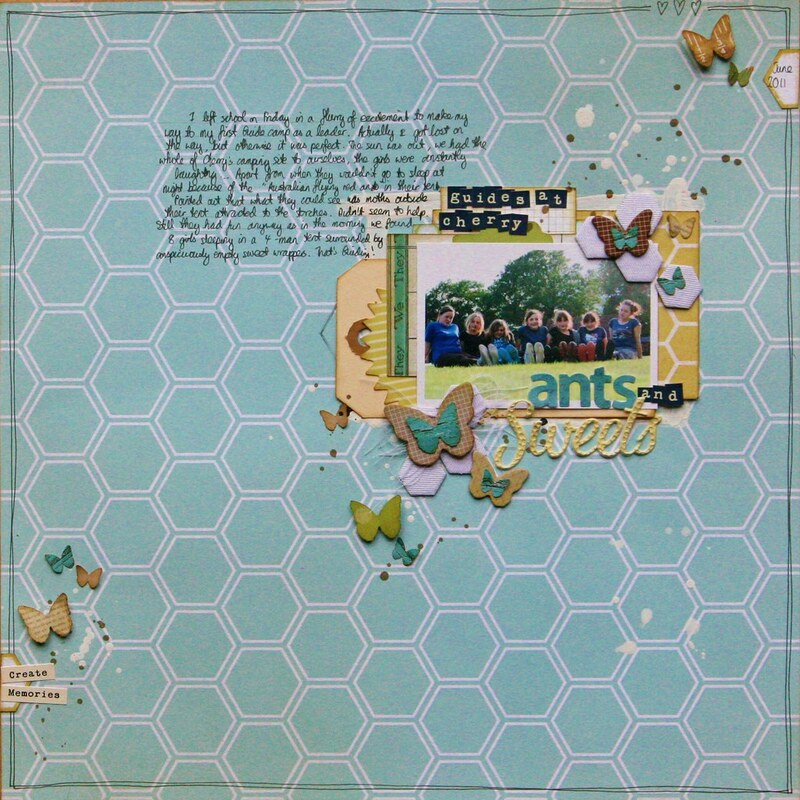 I am totally addicted to your pages, I just fell for them all, I must scraplift your work. this layout is absolutely lovely!! love it! Gosh, congratulations on the promotion - how fab that a new craft room comes with it! And so pleased you enjoyed your first-camp-as-leader too! Sounds like fabulous fun ("australian red ants"!). 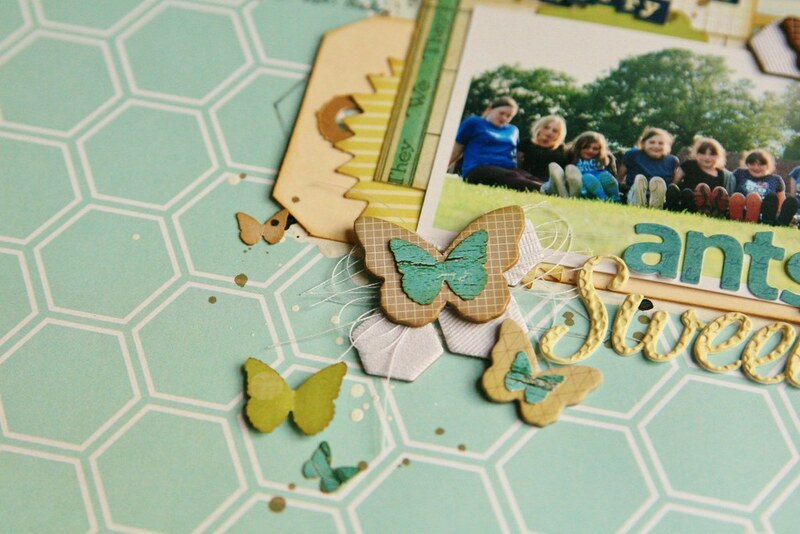 And another great and gorgeous scrap page. You just have a knack for these pages. If I tried to combine these bits & pieces, I couldn't do anything like such a wonderful job of it (unless I totally scraplifted your own pages!). 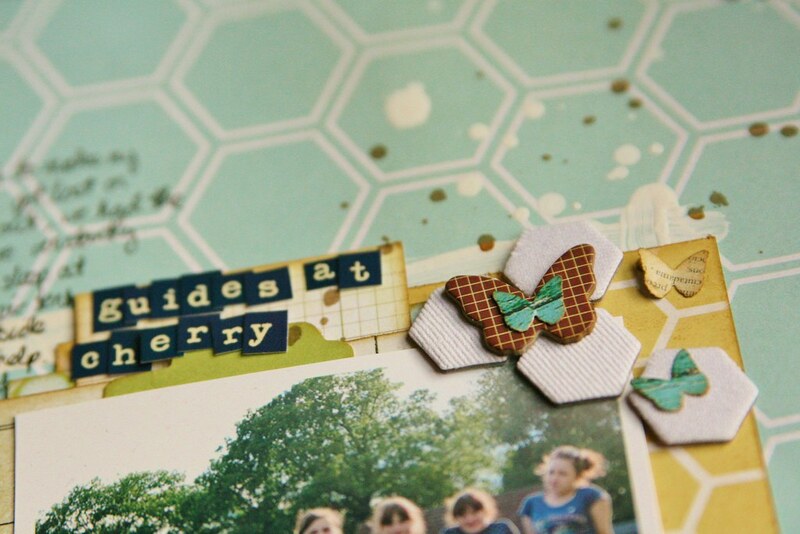 Love this - the background paper choice is inspired, the butterflies (or are they moths?) are lovely. I just love how you take a colour scheme and a theme (in this case, those great little hexagons) and carry it all the way through. That must be why your pages work so very well - I'm a big fan of Miss Smith's Scrapping! wonderful page!!! Congrats on the promotion!!!! The writing on this post is fantastic as well- you made me smile and wish I could go camping- anything involving giant moths and eating 24 hours a day sounds exciting to me!